A silver medal is a medal given to the second place finisher of contests (usually sports competitions) such as the Olympic Games or Commonwealth Games. First and third place finishers usually receive a gold medal and bronze medal, respectively. In 1896, winners' medals were made from silver. The custom of gold-silver-bronze for the first three places dates from the 1904 games. It has been copied for many other sports events. 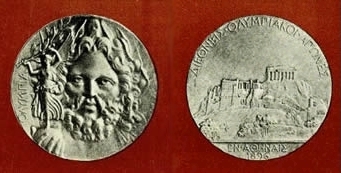 Creating the medals is the responsibility of the host city. From 1928-1968 the design was always the same. One side showed a design by Florentine artist Giuseppe Cassioli with text giving the host city. The other side showed another design of an Olympic champion. From 1972-2000, Cassioli's design (or a slight reworking) remained on the one with a custom design by the host city on the other. Because Cassioli's design showed a Roman amphitheatre for what was originally a Greek games, a new design was create for the Athens 2004 Games. Winter Olympics medals have been of more varied design. In The Open Championship golf tournament, the Silver Medal is an award given to the lowest scoring amateur player at the tournament. This page was last changed on 3 July 2014, at 14:59.